Your Lawn and Landscape is Our Priority! Having a professional lawn and landscape service is important, not only for your home's value, but for the peace of mind which comes from knowing all those unwanted weeds and insects are eliminated. That's why we're here! 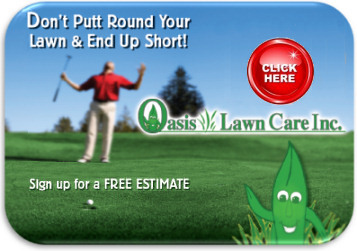 Oasis provides complete lawn care fertilization and weed control services for both residential and commercial properties throughout Stark, Summit, and Portage counties and the surrounding area. You can be assured your lawn will not only stay healthy, green, and vibrant, but will also remain free of unsightly dandelions, clovers, and other problem weeds through our targeted weed control approach. Likewise, our crabgrass control strategies will prevent its opportunities to start, and eliminate any chance for those plants that have emerged. This is why Oasis is the approach you need for the professional results you expect.